It should come as no surprise, that firearms shooting comes with a certain level of risk. I want to address one of these risks, which is the potential damage to our hearing that can result from years of live-fire firearm training. When I was younger, and in the Marine Corps, I was a rifleman and part of a helicopter company. Because I was a young, indestructible Marine, I was resistant to anything that would provide “protection” and this included hearing protection. Much of my live-fire training, combat, lengthy helicopter rides and my time spent on the range instructing Marines, as well as all of my combat exposure was spent without hearing protection. My rationale was that I needed to be able to hear my Marines, the enemy, and in combat we did not have time to insert and remove hearing protection prior to contact with the enemy. Well, after 9 years, this resulted in a moderate level of hearing loss that while not debilitating, is something I would have liked to have avoided. 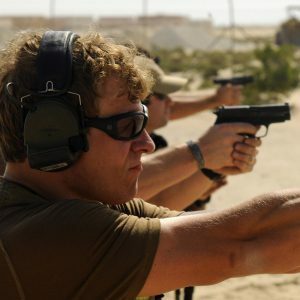 Cops or civilians involved in shootings are not likely to be wearing hearing protection before the incident, and are not likely to suffer permanent hearing loss from the event. But, as we train on the range we should be taking proper steps to protect our hearing. 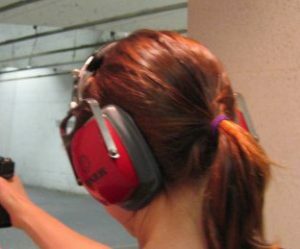 There are two types of hearing protection available for shooters. The “ear plug” type and the “ear muff” type. So which is better for reducing noise level? The simple answer is they both are good options but depending on your application and preference one may be a better choice for you. First off, it is good to encountered noises. As you can see, firearms are quite high on the scale. It is not just the decibel (dB) rating but the length of exposure to the sound. That is why a single shooting is not likely to produce nearly as much hearing damage as a 2 hour rock concert or a worker using industrial equipment all day for their entire career. 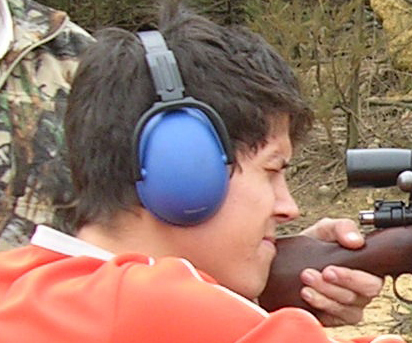 Hearing protection is rated by a Noise Reduction Rating (NRR). Unfortunately, it is not as simple a number to understand and use, as it should be. When you see an NRR rating on hearing protection, you must take the NRR, subtract 7 and divide by 2. The final number is the number you subtract from the dB rating of the noise and that is the dB rating of the noise reaching your eardrum. For example: take a gunshot at 140dB. You are wearing hearing protection with a 22NRR, (22NRR-7=15/2=8.5Db) 140-8.5=131.5dB of sound. Simple right? Not really, because the dB scale is not a linear one, but rather exponential one. What I mean is that a reduction from 110dB to 100dB is a far greater reduction in sound than a reduction from 50dB to 40dB. So it somewhat unnecessary to go into that much scrutiny unless you are going to be exposed to constant gunshots for hours a day. Sustained noise of over 130dB has the possibility of causing permeant hearing damage. Most all types of hearing protection, ear muff and ear plug styles are sufficient to reduce gunshot noise to an acceptable dB level. This is because the actual noise rating for example of 140dB for a gunshot, is calculated directly near the barrel and the noise tends to travel away from the shooter's ears and is actually a much lower level. I have a few different styles of ear muffs that I found to be very good. The first is from Bilsom and is the Thunder T3 model. I have used these for several years and they are great at reducing noise. In fact, as an instructor at times they are almost too good, and reduced voices and noises (like a slide going forward before the command was given). They are on the larger side for ear muffs, but allow for a lot of adjustment and are very comfortable. I decided to get a pair of Impact Sport ear muffs from Howard Leight. These ear muffs use a digital filter to block out high dB noises like gun shots, while amplifying sounds like voices. They work incredibly well and are a must if you are an instructor and need to hear students’ voices on the line. A cool feature about the Impact Sport model is that it comes with an MP3/Phone jack, so you can plug your smart phone into it and listen to music. This may not be important for the range, but you can wear these while using your lawnmower or other machinery and listen to music, while protecting your ears from the more harmful noise of the equipment. They are super comfortable and very compact. I did notice that they did not fit very small heads, like children’s. Overall these are incredible ear muffs. And, if you are patient and hunt around, they can be picked up on sale for just a little bit more than standard ear muffs. I also have a pair of regular old Champion Passive Ear Muffs. These can be found for about $20 and are a real bargain. They work tremendously, are durable and can be adjusted for smaller sized heads. In fact, I was able to wear these, then put them on my 3 year old and they did a great job for both of us! They are very comfortable and fold up pretty nicely for storage. As far as ear plugs, you can pick up containers from single pairs, to boxes of 1000’s depending on what you want. They can be as cheap as a few cents per plug, so they can be very economical for groups or one time use, where purchasing ear muffs might not make sense. As responsible gun owners and users we are always aware of the firearm safety rules and practice them in order to prevent inquiry. Maybe we should throw in another one at the end that reads “wear appropriate safety gear to prevent eye/ear injury.” Stay safe and keep training. Not sure that I understand the worth of hearing protection as described here. In fact I know I don’t. If I read this correctly, the Howard Leight muffs you are wearing are 22NRR. If I am doing the math right, the 22NRR is reduced by 7, making 15 divided by 2 comes up with a reduction of 8.5 db.. A rifle shot is rated at 140 db less the 8.5 db I come up with 131.5 db, still louder than a jackhammer. I have a good pair of muffs and I know that they are more efficient than that. Where am I going wrong? Have you any experience with the Walker’s Game Ear? The muffs I am using have a lot of circuit noise in them and I am looking for something quieter. I already have tinnitis, thus the look for less noise! Hi Ken, thanks so much for the question! I added in a little more explanation of the dB calculation using your exact scenario. Your calculations would be correct, reducing the dB to 131, but this is a deceptive number. If your were experiencing sustained gun shots (8 hours straight)at 140dB you would definitely need double hearing protection to keep from suffering damage. The very highest rating you will likely find (or I have been able to find) for any ear muffs are 30-32RNN. Any need higher thank this would likely be accomplished by doubling the hearing protection with plugs and muffs, and this would most likely be used by someone exposed to non-stop noise of 130dB or higher. I hope it helps clarify a confusing topic, that should be much more simple to understand and calculate. As far as the Walker’s Game Ear I am not familiar with those specific muffs so I wouldn’t be able to give you an honest opinion. I did look up those muffs and they are 31NRR which is on the top of the scale for noise reduction. You could try doubling up the protection by using plugs and your muffs on top. I am sorry for the confusion but I hope I was able to clarify and help out. Thanks again, keep the questions and comments coming, and stay safe! !